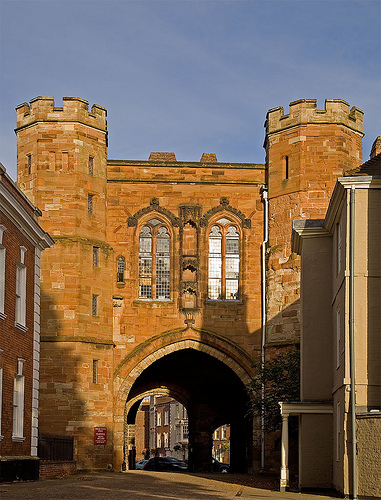 Worcester Castle was first built between 1068 and 1069 as part of the vast castle building scheme instigated by William the Conqueror after the Norman Invasion. The initial castle was built in the motte and bailey design and constructed form Timber. The castle is situated on the East bank of the river Severn within the City of Worcester, and the ditch of the outer bailey cut through the existing cemetery of Worcester’s Cathedral. The Castle was burnt down in 1113 during an attack by Welsh raiders, and was rebuilt, again in wood. In 1204 King John ordered the Gatehouse to be rebuilt in stone. The castle went into disrepair during the 16th Century and it was recorded in the 1540’s that Worcester Castle was “now clean down”. A Gatehouse known as Edgar’s Tower was built in the late 16th Century and this gatehouse remains to this day. The Castle was used as the county gaol between the 17th and 19th centuries. The outer bailey of the castle became known as Castle Green and the motte was slowly demolished between 1823 and 1846.